Wicked witch on Halloween | Outfits - Do You Speak Gossip?Do You Speak Gossip? I didn’t intend on dressing for Halloween that day, since we don’t actually celebrate it in Greece, but the result was very Halloween-esque not to post it today. I really wanted to wear my forest green lipstick, because I really like it, but it’s difficult to wear such a bold color in your everyday life in my small town. So I decided it to tone it down with a matching hat and jacket. I really liked the result, but the truth is that it’s one of those outfits that look much better in real life than in photos. I didn’t actually loved the result of these, but I decided to post them anyway. The wind was blowing my hair in my face all the time, and the hat left my head numerous times, so we had to take hundreds of photos that day, for me to be able to find enough for this outfit post. It’s actually the first time I’m wearing this dress, and even though I liked it very much on the site, I’m not sure about it on me. I had to size up, for it not to look too tight around my hips, but since I’m “pear-shaped” it’s big around the arms, waist and bust, so I think I have to take it to my seamstress to fix that. 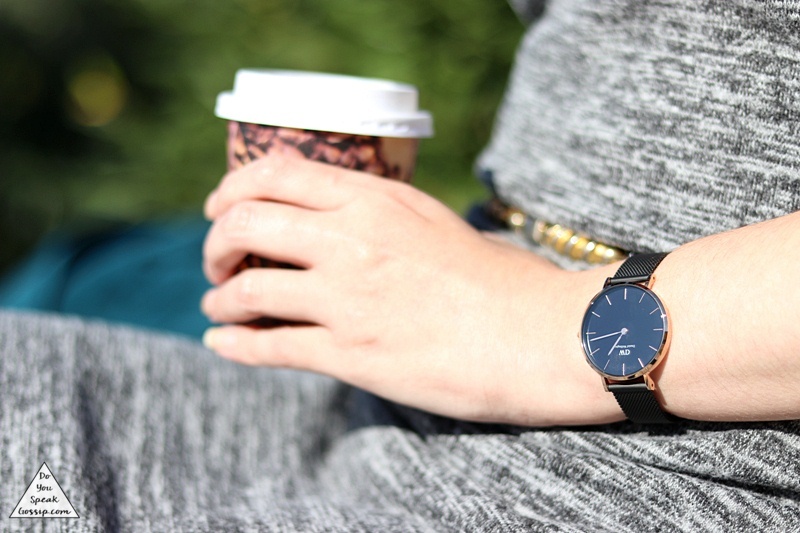 Also new, is my Daniel Wellington watch in black mesh and rose gold. You have 15% off with the code “SPEAK” on their site, if you’re interested. What do you guys think about this look? Τί τρελό τυπάκι είσαι εσύ??? ΑΠΙΘΑΝΟ! Εντυπωσιακό και το φόρεμα και το πώς συνδύασες τόσο έντονα χρώματα και μάλιστα κατάφερες να τα υποστηρίξεις, χωρίς να σε “καταπιούν” εκείνα! syros2js recently posted..…ΣΕ ΦΥΣΙΟΛΟΓΙΚΑ, ΓΙΑ ΤΗΝ ΕΠΟΧΗ, ΕΠΙΠΕΔΑ…! That lipstick looks amazing, and I love that it matches your hat and jacket!